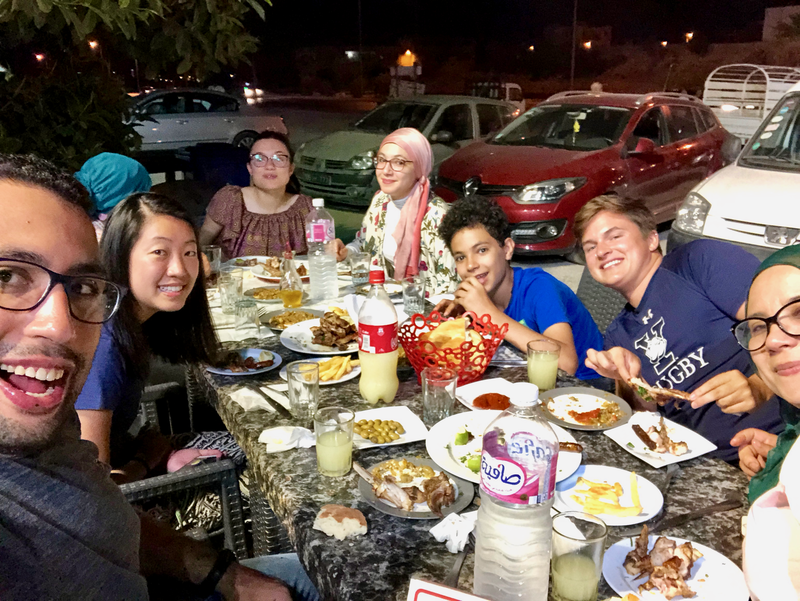 I don't think I've ever experienced such hospitality the way I did in the four days I spent visiting my friend Wissem Gamra and his family in Tunisia. To provide just a snapshot of their generosity: weeks before Nat (who also came to visit Wissem!) and I arrived, Wissem planned for us a packed itinerary from the ruins of Carthage to the Atlas Mountains to the Great Mosque in Sousse. He chauffeured us around the entire time, answering our every question and pointing out hidden gems left and right. He and his three younger siblings (Syrine, Nour, and Youssef) insisted on sleeping on the couch so that Nat and I both could have our own rooms. His mother made sure our meals in her house were so wonderful that neither Nat nor I would be able to resist pulling out our phones to take pictures. If that weren't enough to illustrate my point, who else's family would decide to invite in, feed, and ultimately adopt a stray baby cat that refused to go away?! Almost entirely Arab and Muslim (in contrast to, say, Egypt, which has a sizable black population in the south and a significant Coptic Christian contingent in the north). Am I in Tunisia... or Europe? Our first stop on Sunday morning was to the ruins of Carthage. After a simple, but delicious breakfast of sweet sandwiches (honey + cheese on a baguette) washed down with whey, Wissem, Yasin (Wissem's friend who lives in Tunis, and our awesome tour guide for the day), Nat, Syrine and I found ourselves gazing at the ruins of what used to be a massive Roman bath. Having just been to Rome over spring break, I was impressed that this bath was better preserved than any of the baths I'd seen in Rome. "You know, if only we'd won the Second Punic War, Carthage would've ruled Europe instead of Rome," commented Yasin. Up until that point, I hadn't considered how closely intertwined the histories of Italy and Tunisia really were. Nat and I at the Colosseum (once used for gladiatorial spectacles, just like its Roman counterpart) in El Jem! Wissem said he once watched an opera here. Our next stop was the Acropolium, a Roman Catholic church built by the French, which had plaques with the names of crusaders lined the walls. We also visited a palace that was home to a Baron and musicologist. Yasin said that he'd once attended a musical performance in the space, which must have been a magnificent experience. For lunch, we went to a café along a street where if anyone had told me I was in Europe, I could easily have believed them. While it may not be surprising to know that this area is known as the French Quarter and that all the menus were in French, I soon came to realize that everyone everywhere spoke French, not just in the French Quarter! In Tunisia, French and Arabic are spoken interchangeably, often in the same sentence. Street signs have both French and Arabic (and sometimes German and Italian). 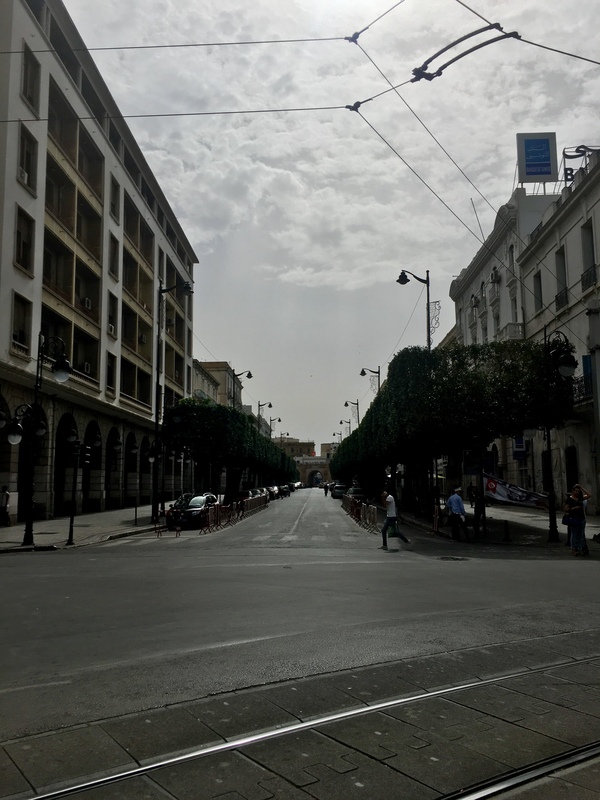 Trees lining the streets, European-style buildings and arches, even tramway tracks! At 6 am the next morning, Nat, Wissem and I woke up to a delicious spread already awaiting us at the breakfast table: apricots and sesame paste, baklava, little white almond pastries, figs, grapes, nuts, instant coffee and warm milk. After we ate our fill, Wissem's mom drove us a few blocks to catch a tour bus that would take us all around the country in 36 hours. "You're here for such a short period of time, so I wanted you to see as much as possible!" said Wissem, the greatest host ever. The tour guide was visibly thrilled to have a Tunisian on board, cheerily telling Wissem that he would translate everything to English just for us, as everyone else on the tour was German. My camel was the cutest! On the set where Star Wars was filmed! The fictional world of Tatooine was actually inspired by the nearby Tunisian city of Tataouine, which frankly looks quite similar. We found water at an oasis at the foot of the Atlas Mountains. Deserts are hot. On Wednesday, Wissem drove me, Youssef, his mom, Nat, and me to the beach. Expecting that we'd spend most of our time in the desert, I hadn't thought to bring my swimsuit, but Syrine was kind enough to let me borrow hers! Similar to the beaches along Sahel, Egypt's North Coast, the sand was white and the water was a beautiful blue. On our way back to the car, we ran into one of Wissem's aunts and a whole flock of children- in what I soon realized was a recurring trend in Wissem's family, his aunt refused to let us go without insisting we each try one of the french cookies and mille feulle slices she'd been carrying with her. In the two days I spent in Wissem's house, I was introduced to more extended family members than I could keep track of, usually dropping by unannounced, which only serves to again illustrate how kind and welcoming his family is. "We typically have someone over for dinner every three days," said Wissem, when Nat and I expressed our amazement at the number of people poking their heads in to say hello. Raw almonds in tea- delicious! "Dumb question- what percentage of Tunisia is black?" I asked Wissem, wondering whether there was north-south geographic divide in representation, like in Egypt. "Honestly, I only know one black Tunisian," he replied. Again, Tunisia differs from its North African neighbors; the country is also 99% muslim. On Wednesday morning, Wissem's sister Nour taught me how to tie a headscarf before we went to visit the Great Mosque of Sousse. It was my first time entering a mosque, and I was immediately struck by 1) the layout of the mosque in that it consisted of an open air courtyard with prayer halls along the rim, and 2) the fact that there weren't any chairs. It was quite a departure from the churches and synagogues, and even Buddhist temples I've visited in the past! Primed since youth by mailers depicting third world countries as sites of tragedies in need of first world support, yet at the same time so far removed from the scenes depicted, it had been all too easy for me to imagine African countries as existing in a separate sphere, on the other side of a chasm dividing the first and the third world. Yet the grandeur of the country that boasted ancient Carthage, the fire of a people who set off the Arab Spring, the carefree excitement of today's beachgoers and tourists, shows that while a unique culture and perspective do indeed demarcate a difference, the dichotomy is a lie, a simplification. There's far more nuance involved in this country not only influenced by the West, but that also shaped and continues to shape both Western civilization and the rest of the world. Early Thursday morning, I woke up for one last delicious breakfast in the Gamra household before Wissem and Nat drove me back to the airport. As reflect upon my incredible visit to Tunisia, my heart is overflowing with gratitude to Wissem and his family for welcoming me into their home and showing me all around their beautiful country. I hope that I'll have the chance to visit again one day, and soon!